Pachamama Alliance holds annual fundraisers for supporters, allies, donors, activists, and people new to this conversation to come together in their shared commitment to bringing forth a thriving, just and sustainable human presence on our planet. Watch a short video highlighting the experience of our Annual Fundraisers. 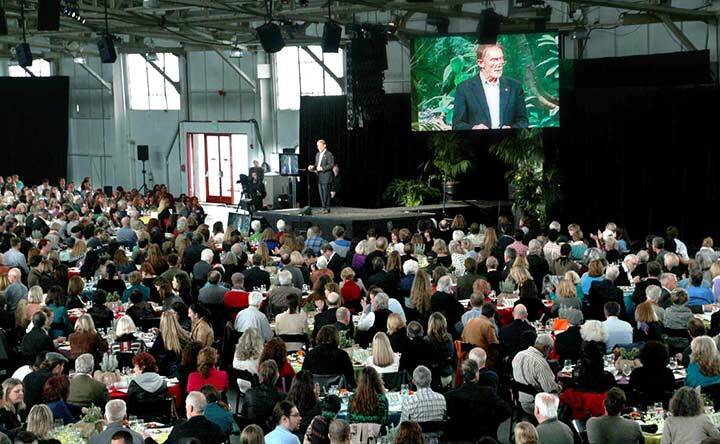 Pachamama Alliance Annual Fundraisers are transformational experiences. They are opportunities to connect and realize that you have allies in your backyard, across the globe and in the heart of the Amazon—all standing together in service of an environmentally sustainable, spiritually fulfilling and socially just human presence on this planet. Our Annual Fundraisers are filled by Table Captains who invite their family, friends, and coworkers to become conscious investors and partners in the work of Pachamama Alliance. Creating an opportunity for your guests to be inspired by putting their resources behind their highest commitments and re-allocating their resources towards a brighter future. Empowering yourself by introducing 10 of your family members, friends, or colleagues to this transformative work and community, which you are passionate about supporting. Broadening your network of like-minded people as well as re-connecting with Pachamama Alliance supporters who you haven't seen in some time. If you would like to learn more about being a Table Captain at one of our Annual Fundraisers email tablecaptains@pachamama.org. Hundreds of volunteers help produce our Annual Fundraisers, ensuring that we maximize the amount of funds that can go directly to our work in the Amazon and around the world. If you would like to learn more about volunteering at one of our Annual Fundraisers email Lindsay Dyson at lindsay@pachamama.org. We have a limited number of individual seats available at each Fundraiser. If you are just getting your toes wet for the first, or you are a seasoned participant, this is a great way to get in the action—come alone or bring a friend. Please visit the event page of the fundraiser you're interested in joining to learn how to attend in person. If you are unable to attend one of our Annual Fundraisers in person, you can still participate. Each year we stream the San Francisco Fundraiser. Sign up for our email updates to receive more details as this year's San Francisco Annual Fundraiser approaches. We invite companies who share our mission and vision of an environmentally sustainable, socially just and spiritually fulfilling world to invest with us as a luncheon sponsor. This partnership offers increased visibility to the deeply committed community of Pachamama Alliance supporters around the world. If you are interested in becoming a sponsor of our Annual Fundraisers, email Melissa Trimble at melissa@pachamama.org. Pachamama Alliance co-founders and staff host Annual Fundraisers for our community which have featured many special guests including Paul Hawken, Joanna Macy, Van Jones and our indigenous allies from Ecuador. For our community at-large, these annual updates and fundraisers allow each person to be nourished by the Pachamama Alliance community and provide the opportunity for each of us to further align our time, energy, connections, and financial resources with our vision for the world. Attendees have the opportunity to share a meal with other like-minded members of the global community, be inspired by the work of the Pachamama Alliance, and learn what can be each of our roles in having our dreams and visions for the world fulfilled. The San Francisco Annual Fundraiser, our flagship event and biggest homecoming, brings together over 1200 people in person and another 1500 online, serving as our biggest fundraiser of the year. With growing communities across the country and around the world, we have expanded to host an annual Fundraiser in New York City, with 2018 marking our seventh year. The Fundraisers serve as incredible examples of how collectively we can intentionally reallocate our resources to build a world that aligns with our values. Participants see that their investments — no matter how large or small — make a difference. After attending a Fundraiser, people are empowered knowing that they are preserving one of the most bio-diverse places on the planet and that they are awakening individuals to get into collective social action to bring about a world that works for everyone where no one and nothing is left out. Interested in attending a Fundraising event? Check out the list below to find one in your area. No events near you? Sign up to receive our email updates.